Recently, the blog Tasting Table posted about a little restaurant in Brooklyn, NY, called Take Root. I was moved by the story of two married women who make this single seating, 12-course tasting menu restaurant both their livelihood and their artistic passion. The New York Times review quote on their website gives a sense of the generosity that comes through their food, “It is a rare thing to pay for a meal but feel as if it were a gift”. The two of them do everything in the restaurant from the ordering, to the prepping, to the serving, to the washing up. Then they drop into bed at night, have an excellent cup or two of coffee in the morning, and begin it again. I have experienced a similar spirit at a restaurant in Tunis. Teaching a comparative religions unit, to my 7th graders, on the monotheistic faiths, we took the first of 3 off-campus visits to observe and experience the religion and culture of specific faiths in Tunis, this time Judaism. Jacob, our host at the kosher restaurant/Jewish cultural center began his talk to us, in his heavily French-inflected English, saying the history of the Jews in Tunisia is a love story. By that, he means both the love of Jews for Tunisia and also the general acceptance they have enjoyed here. His restaurant Mamie Lily is his mother’s cooking, assisted by some local help. The neighborhood where it is set, La Goulette, is historically an immigrant neighborhood, being near the Port of Tunis and the fishing piers. It has the pace and simplicity of the 1950s. The tiny synagogue is just around the corner and along the street, in between, you could buy all of the artfully displayed fresh produce, the kosher chicken, and the fish with fins that Jewish dietary laws require. Then, mother Lily puts a loving hand to the cooking, along with a little French technique and Tunisian custom. She and her staff prepared a set meal for 50 of us and the main course, chicken in a pumpkin sauce with a hint of lemon, was particularly where the knowledge of local tradition and the cooking skills of Mamie shown through. Our 12-year olds, being much like 12-year olds the world around, found that sauce to be a challenging new taste, but they got to try it, and I am happy about that. I had been cueing up to make this Bon Appetit recipe for a fresh pumpkin carbonara sauce. I carried a little of Take Root’s ethos through by blanching and freezing fresh herbs in ice-cube trays and then grating them with a micro-plane grater to use. I also finished my carbonara sauce with a squeeze of lemon to try and hit that silky sweet/tart balance of Mamie’s sauce. The thing I think Take Root, Mamie, and I are sharing was summed up in the TT article: …trying to coax big flavors from humble ingredients. 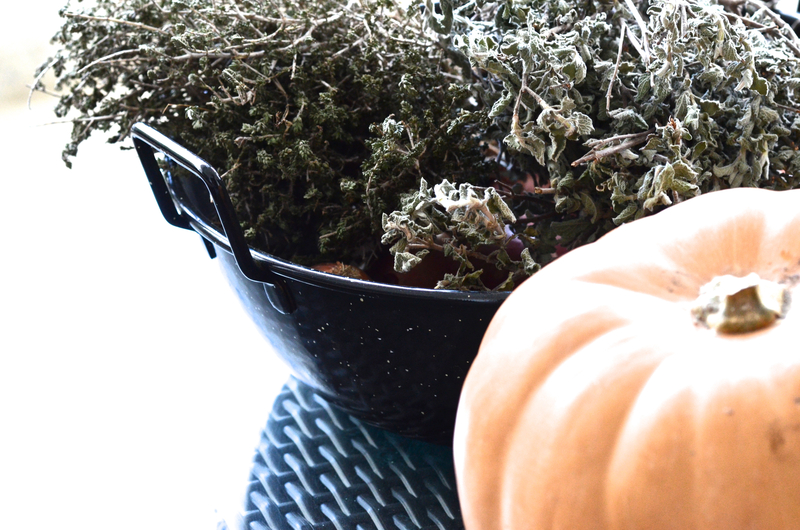 This pumpkin sauce is useful as a sauce or as a soup. I suggest you make up a huge batch and put a couple of quarts in freezer bags for either use. Also, take the few extra minutes to make some handmade pasta. 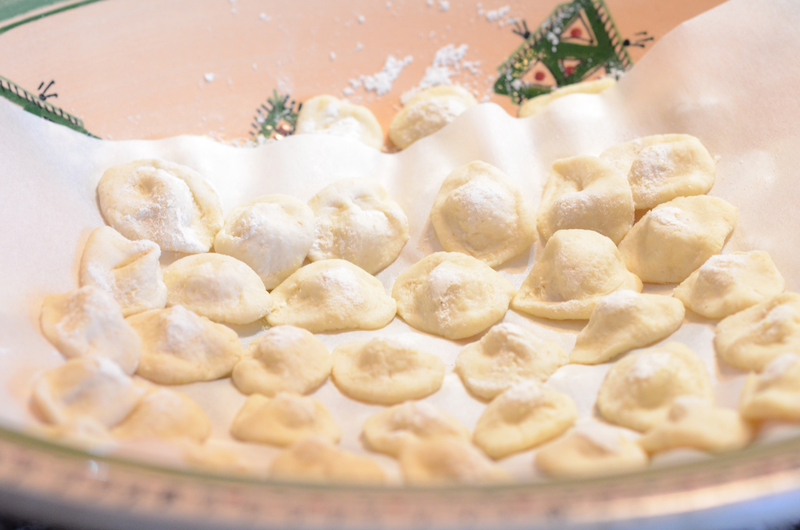 These orechiette are really not difficult and they cook up to make chewy little cups for holding this rich sauce. Heat oil in a large skillet over medium-high heat. Add pancetta, reduce heat to medium, and cook, stirring occasionally, until crisp, 8-10 minutes. Add sage and toss to coat. Using a slotted spoon, transfer pancetta and sage to a small bowl; set aside. Add squash, onion, and garlic to skillet; season with salt and pepper and cook, stirring occasionally, until onion is translucent, 8-10 minutes. Add broth. Bring to a boil, reduce heat, and simmer until squash is soft and liquid is reduced by half, 15-20 minutes. Let cool slightly, then puree in a blender until smooth; season with salt and pepper. Reserve skillet. Combine pasta, squash puree, and 1/4 cup pasta cooking liquid in reserved skillet and cook over medium heat, tossing and adding more pasta cooking liquid as needed, until sauce coats pasta, about 2 minutes. Mix in 1/4 cup Pecorino; season with salt and pepper. Serve pasta topped with reserved pancetta and sage, shaved Pecorino, and more pepper. Do Ahead: Squash puree can be made 3 days ahead. Let cool; cover and chill. Combine durum wheat flour and semolina flour in a large bowl. Bring a saucepan of water to a bare simmer. Add 2/3 cup hot water to the flours and mix with a fork until mixture just comes together. Turn out dough onto a surface lightly dusted with durum flour and knead until smooth and elastic, 8-10 minutes. Alternatively, mix in a stand mixer fitted with a dough hook for 5 minutes. Wrap tightly in plastic wrap and let sit a room temperature for 1 hour. Want one more delicious but humble recipe from Take Root? I’m going to be making their Beans and Greens this week. Wonderful recipe for the pumpkin sauce.